I met Palla in a former prison, and torture center. We talked in the courtyard of 'S-21', a former Khmer Rouge prison in Cambodia, known as today as the Tuol Sleng genocide museum. A Khmer woman in her 50's, her hair is pulled back and parted. But what really stands out is her face, which has the look of a woman who has struggled to survive. I sat down on a bench with Palla to learn more about the prison, but her own story was also gripping. As a flock of birds hopped about on a nearby railing, her story unfolded. Palla was just a girl from military family in the eastern town of Svay Rieng when the war with the Khmer Rouge began. One brother was a Navy captain, another in the Air Force. As the war raged, she eventually moved to Phnom Penh in the early 1970’s for safety. When the war ended in 1975, she was only 17, a young bride when the communist Khmer Rouge entered the capital. Folks were initially happy, as the war was finally over. But the Khmer Rouge immediately forced everyone to leave the city, and walk into the countryside. Palla says that she didn’t even have time to go home and pack up belongings to take with her. Additionally, the Khmer Rouge forced people of different neighborhoods to march out of town in different directions, so her family was split up immediately. So they marched to totally different parts of the country. She never saw some of her relatives again. Palla's first husband was killed by the Khmer Rouge shortly after the war ended. As an Army soldier, he was targeted for execution. Her first daughter, and her father, died of starvation in Khmer Rouge labor camps. 4 of her 10 brothers and sisters died during the Khmer Rouge genocide. Her mother didn’t survive either. Somehow, Palla learned how all of her relatives were killed by the Khmer Rouge. She told me how this one was clubbed to death, that one was drowned, that one was killed by bamboo pole strikes to the back of the head and neck. 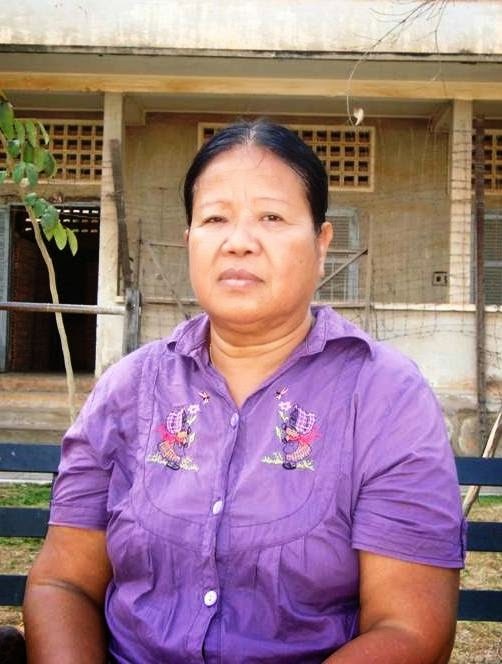 If the Khmer Rouge cadres had learned of Palla's background, she would have been killed too. But immediately upon leaving Phnom Penh, everyone in her family changed their names. She shortened her name from ‘Palla’ to ‘La’. Under orders, she did all kinds of manual, forced labor during those years of communism. She labored to make dikes, and canals. She worked on farm communes, planting and harvesting rice and corn by hand. To work different projects, the Khmer Rouge forced her to move back and forth from the east side of Cambodia to the west. Sometimes she walked for days. When she was lucky, she was transported by truck, boat or train. When the Khmer Rouge were finally forced out of power, she returned to Phnom Penh. One surviving brother became a policeman. Palla's sister used to be a French teacher, and she became the first director of this grim museum of genocide. Having that position, she was able to give Palla a job here at Tuol Sleng as well. Palla has worked here since 1979. Palla's first job was cleaning this wretched place, not a pleasant task. When she first cleaned out the wooden and brick prison cells that I had visited, Palla had to remove scorpions and lice! Even worse, the interrogations rooms had pools of blood left on the floors from their final torture victims, and she was responsible for cleaning them all! Although she cleaned up of most of the dried blood, she left some blood spots on the floors for future evidence. Palla married again after the war, and had three more children. But her second marriage wouldn't last either. In 1984, in the midst of the Vietnamese war with the Khmer Rouge, her husband left to escape to Thailand. She never heard from him again. Palla thinks that he’s dead. Like so many others that tried to escape to Thailand, he may have died in the minefields, though she may never know for sure. One of her sons also died years later in a motorcycle accident. After the war, Palla took classes to learn English. Eventually she become more than a cleaner here, she also became a guide for the genocide museum. She is also a witness, as this prison has additional family connections for her. When written prison records left behind by the Khmer Rouge were examined, Palla learned that her brother and sister-in-law had been imprisoned here. 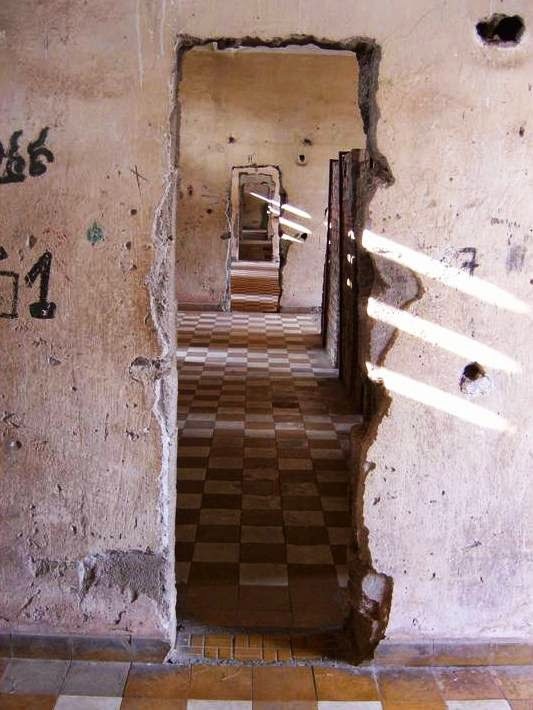 Her brother had been an Air Force pilot, before he was eventually captured and brought to Tuol Sleng with his wife. They both were executed. They had found the document with her brother's signed confession, obtained through torture, like so many others sentenced to death here. Palla tells me that she had a dream last night about her father. She misses her daughter too, the one that died in the famine brought on by the Khmer Rouge. She sometimes cries, because she has enough food to eat now, and back during the famine her daughter didn’t. Palla had no medicine to give her daughter back then either. She says that now medicine is available, and cheap in Cambodia. She says back to me, “They saw me strong. But I have broken everything. My heart, stomach, eye.” Palla has to take a heart medication these days, and also lost vision in one eye five years ago, to a cataract. She gets by ok these days, but she can’t afford cataract surgery. Still, Palla has a positive outlook on life, as she's a survivor, and far better off than before. She currently lives with one of her surviving daughters and grandchildren. “Everything now better,” she tells me. “I have food, rice. I have better than during Khmer Rouge (years.) I don’t have car or motorcycle, but I don’t care. My life is now better." As I leave Tuol Sleng, I'm glad that the last thing I remember about this prison, is Palla's smile after I gave her a $20 tip.